Magic Love Slots is 9 reel 8 paylines video game released by NetEnt. Enjoy pure magic of love with passion preparing the best present for you. Love is a mystery with its own rules and strategies to win. Follow your soul to allow luck bring you all the treasures of this affair. Try and win the top jackpot of 2,000 coins. Dive into the sweet-caramel world of gentle kisses with no download format available. No special software installation is necessary. You just play directly though the browser to feel pure love instantly. Diamond Rings, golden Champagne, purple Hearts and dark red Roses to create the atmosphere of real happiness and romantics. Luxurious Car to take you to the land of evergreen Palms, sandy beaches and soothing breeze. Single Bars, Double Bars and Triple Bars just remind you that this is classic game. Traditions rule the world of love… but don’t forget to add something really passionate into your love game. You can’t buy love… but still try with such coin sizes as $0.10 or $0.20. Not to many options. Just black and white. Yes or no. Love thinks simple. There is also one choice only. To risk all and play with the maximum total bet of $12.80 or choose the easiest way with only 1 coin per line staked. The minimum bet to cover all 8 paylines will be $0.80 in this case. The highest Love jackpot is 2,000 coins or $3,200 for 9 Cars. The second Love jackpot is 800 coins or $1,280 for 8 Cars. 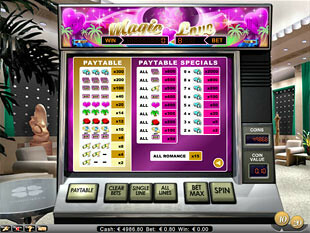 The third highest Love jackpot is 600 coins or $960 for ALL Triple Bars. The catch of this game is that you have 9 reels to get your prize. There are really a lot of winning combinations to collect on the paylines. It can be the best 9 symbols combo as well as 3 symbols and even 1 symbol to win some nice award. Just imagine filling all the reels with 9 Cars appearing. Love will definitely take you to some magic place where all the great expectations and hopes become a reality. One bottle of champagne and prize is yours. Of course, to make mood better you need two or three bottles of this romantic drink. However, to feel even better you need hearts beating for you… or some diamond ring to glitter in your soul. Your aim is to catch the same symbol on ALL reels. It will definitely bring you some huge prize. 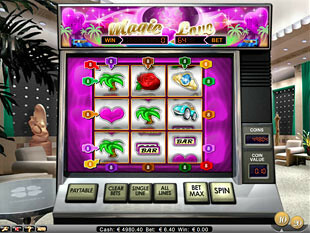 Magic Love slot machine whispers you love song with new features to play classic affair game. Holding on the things that make you happy… and rich.